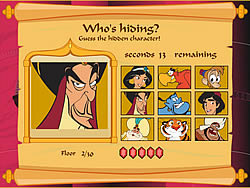 In this game you are Aladdin from the Disney's cartoon. You're flying on the flying carpet and enter various floors of the tower. There's a quest you must solve on each floor. There'll be several characters from Aladdin cartoon to your right and a rectangle to your left. Small pieces of the rectangle will be revealed. Your goal is to guess what character is hidden there and select this character in the right-hand part. If you can't do it before the time is over, you lose the game.